The harbor was known as Kuloloia. It was entered by the first foreigner, Captain William Brown of the English ship Butterworth, in 1794. He named the harbor “Fair Haven.” The name Honolulu (meaning “sheltered bay” – with numerous variations in spelling) soon came into use. Kamehameha I, who had been living at Waikīkī since 1804, moved his court here in 1809. His immediate court consisted of high-ranking chiefs and their retainers. In 1815, Kamehameha I granted Russian representatives permission to build a storehouse near Honolulu Harbor. Instead, directed by the German adventurer Georg Schaffer (1779-1836,) they began building a fort and raised the Russian flag. When Kamehameha learned of this, he sent several chiefs to remove the Russians. The partially built blockhouse was finished by Hawaiians; they mounted guns protected the fort. Its original purpose was to protect Honolulu by keeping enemy or otherwise undesirable ships out. Charlton claimed this and other lands as his personal property. He also claimed land down by the waterfront. There was no disagreement over a small parcel, Wailele, but the larger adjoining parcel he claimed (Pūlaholaho) had been occupied since 1826 by retainers and heirs of Kaʻahumanu. In making his claim for Pūlaholaho, Charlton showed a 299-lease dated October 5, 1826 issued to him by Kalanimōku. That claim, made in 1840, however, was made after Kalanimōku and Kaʻahumanu had died. In rejecting Charlton’s claim, Kamehameha III cited the fact that Kalanimōku did not have the authority to grant the lease. At the time the lease was made, Kaʻahumanu was Kuhina Nui, and only she and the king could make such grants. The land was Kaʻahumanu’s in the first place, and Kalanimōku certainly could not give it away. (Hawaiʻi State Archives) The dispute dragged on for years. This, and other grievances purported by Charlton and the British community in Hawai‘i, led to the landing of George Paulet on February 11, 1843 “for the purpose of affording protection to British subjects, as likewise to support the position of Her Britannic Majesty’s representative here”. Following this, King Kamehameha III ceded the Islands and Paulet took control. After five months of British rule, Queen Victoria, on learning the injustice done, immediately sent Rear Admiral Richard Darton Thomas to the islands to restore sovereignty to its rightful rulers. On July 31, 1843 the Hawaiian flag was raised. The ceremony was held in area known as Kulaokahuʻa; the site of the ceremony was turned into a park, Thomas Square. Click Here for a prior summary on those events. On November 26, 1845, legal title to Charlton’s land claim was secured and was sold to British businessman, Robert C Janion (of Starkey, Janion and Co – that company later became Theo H. Davies & Co and one of Hawaiʻi’s ‘Big 5.’) (Liber 3:221; Maly) Charlton stayed in Honolulu until February 19, 1846, when he left Hawai’i for the last time. Pūlaholaho was subdivided and Janion auctioned off the properties in 1846. Captain Heinrich (Henry) Hackfeld opened a store on one of them in October 1849. His company, H Hackfeld & Co, later became American Factors, Amfac, another Hawaiʻi ‘Big 5’ company. 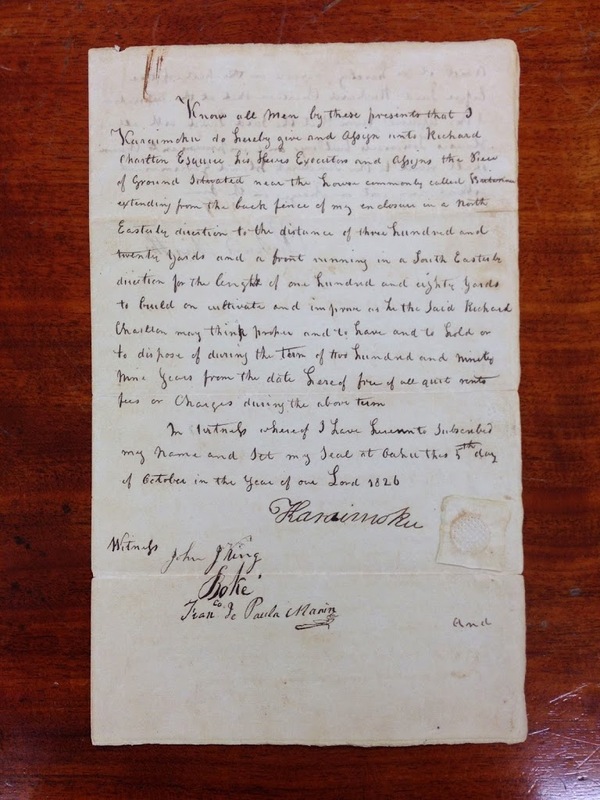 The image shows the 299-year lease for the Pūlaholaho property to Charlton, signed by Kalanimōku. (HAS) In addition, I have added other images in a folder of like name in the Photos section on my Facebook and Google+ pages.